← Can you turn your blog posts into cash? This historic mill is just a few miles down the road from my new home in Floyd. I discovered it while trying to assist someone who is touring Floyd this weekend in search of old mills. This visitor was not internet-enabled, so he was having a hard time getting information about Floyd’s old mills. I used Google to locate the mill and took twenty pictures for future tourists. 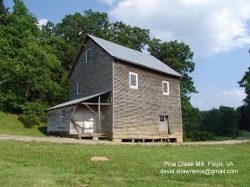 Visit my new weblog, Floyd County Scenes to see the first of many posts on the unique sights to be found in Floyd County. This entry was posted in Country Living. Bookmark the permalink.